Sometime in late 91 or 92, I was working in Boulder Colorado across from Toys “R” Us. I was never in a dark age per se, I just never really spent a lot of money on Lego. One day when I was over at Toys “R” Us, I saw Lego monorail system. They were different from any other Lego and seemed at the time and something I might be interested in. I’m a big fan of trains, I’m sure I got that from my grandfather he was a Santa Fe locomotive engineer. I have a good selection of HO trains which I got started collecting in the same job I was working at in Boulder. I noticed the price on the monorails were quite high. $130 and up, was quite a bit of money at that time so I knew I was going to have to save up for it. After a few weeks, I have assembled about $150. I went over to Toys “R” Us after work one day to pick up one of the monorails. I can’t remember which one it was, by looking at catalogs and a few websites, I believe it was the Futuron monorail that was available time. When I got to Toys “R” Us, the shelf for the monorail that was empty, they were sold out. I knew I’d be back for later and decided to pick up the monorail accessory track. It came with some large curves, large straight pieces, small straight pieces, one by 4 connector plates, and an assortment of stanchions. I got home broke open the box and assembled monorail track. I got excited and I knew I wanted to go buy one. Shortly thereafter, I changed jobs and was no longer working in Boulder. Without having the Toys “R” Us sign glaring at me everyday when I was at work, I forgot about it. A year or 2 drifted by, and other than making a few buildings I was in my mini dark age. And then I decided to move to another state, and the monorail was completely forgotten. By then they had ended the monorails for good. I used the track I possessed to build rail stations things like that, but had no trains were monorail to put on it. So, to make a long story shorter, recently I was checking out Louise Dade’s power function monorail she had on Flickr. While I was browsing eBay for who knows what, I put in “Lego monorail” in the search. I was kind of surprised at how much stuff was out there. I’m also still quite shocked at how much people want for these sets. Do they really think they are going to sell these things for $1000-$3000? I did find a set of the futuron monorail, it was the track, motor, car bases, stanchions, and some miscellaneous pieces. It was little more pricey than I was hoping for. It was a buy it now and not an auction. There were also several other auctions for the complete set, the airport shuttle, and bits and pieces for monorails. so I decided to go ahead and buy the set, I also bid on 4 or 5 of the other monorail sets. They all quickly exceeded my budget which helped me make my decision. Of course after all that I had to make a trip to BrickLink. So quick search on BrickLink, revealed a small amount of monorail stuff. Including complete sets for a buttload of money. Again I’m surprised these people I’m BrickLink sell things, they must really want to keep it. I made a decision about what I wanted and how much I pay for it. I bought an extra motor, cable for the motor, extra battery boxes, car bases, and miscellaneous track. Of course being who I am, that wasn’t enough. I then purchased, some switches, and more track. The guy who had bought the switches from I didn’t realize he had as much monorail stuff as he did. I made him an offer for the whole store of monorail stuff and he came back with a counter offer that was within what I was willing to pay for. A quick look over all the orders and I found I somehow needed one piece from one order that I picked up in another order. I also realized I might have to buy a few more things. But those are parts that I don’t think will be that big of a deal the pick up later after I paid for everything I just bought. I found out I hate package tracking because on July 4th, I looked at the tracking and saw that was sitting at my local post office waiting to be delivered. The Fourth of July is a federal holiday and there is no mail delivery on that day. So I wasn’t going to be able to get it when I expected. The following day package arrived with my monorail. On the 3rd I had already received the extra motor and cable. I quickly inventoried everything in gave the proper feedback all at stuff. 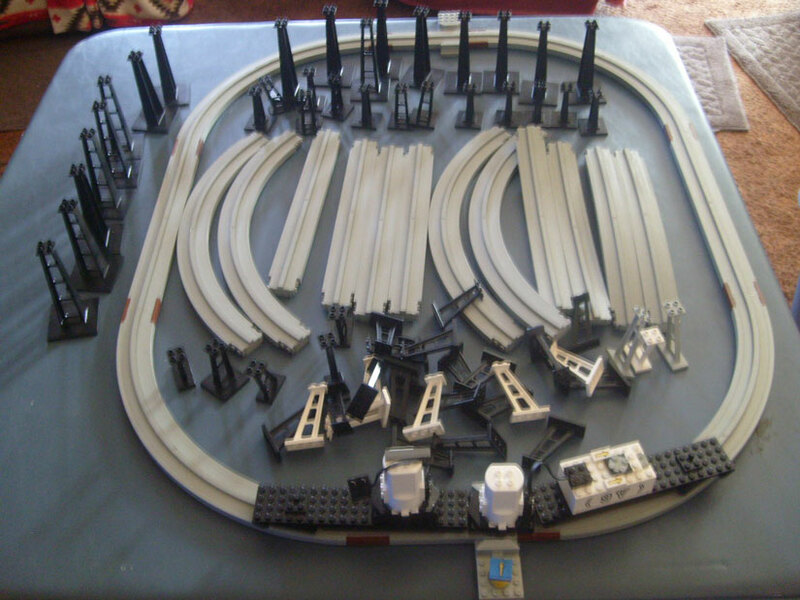 I then assembled the track that came with the monorail I ordered and the track I have purchased many years ago. I had found all the pieces except the 2 small straight parts. I put batteries in the battery box hooked up everything and turned it on. It went around and around and around and back and forth and back and forth and around and so on. So from that point on I began what I’m calling, “The Fairview Monorail Project”. I’m documenting the building of my monorail. I don’t have the space to permanently set it up, but it is something fun to play with. I’m also planning using it in my comic, which justifies the expense and that’s when we keep telling myself like I do with every Lego purchase. I will have pictures of various stages of the monorail from ordering, to receiving, to testing, to building, and anything else I can come up with. I will also have video of each step sometimes.So stay tuned and keep on reading, and I’ll get it posted on the site.